Why did it take me so long to read this??? 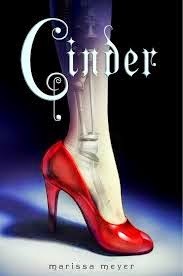 Cinder is based on the Cinderella fairy tale, and I love the inventive ways Marissa Meyer uses this well-known story line. Cinder is an unglamorous mechanic, a cyborg, and ward to an evil-stepmother. She has a mechanical foot instead of a glass slipper, and no real desire to attend any ball, even one in honor of the very handsome Prince Kai. There's nothing I didn't love about this girl! Add a horrible plague afflicting citizens everywhere, including Cinder's beloved step-sister and the King. Add an evil Lunar Queen determined to rule Earth with her mind tricks. Oh yeah, and if that's not enough, add Cinder's mysterious origins. Is she really just a lowly orphan her step-father took pity on and adopted? Or is she something more? I loved all the twists and turns this novel took. Every single character, even the minor ones, were well drawn and three-dimensional. I found myself sucked into this world of New Beijing, and can't wait to read more! Same! I love Cinder and the Lunar Chronicles. I can't wait for Winter to come out! :) Can't wait to see more of your reviews! This series is totally great. I don't like any other fairytale retellings, but this one is so inventive and refreshing. It also took me until January to read Cinder, so you're not the only one who is a little late. At least now you can read the next two volumes back-to-back. The ending would've killed me if Scarlet hadn't been out already.